Comic Bento apparently wanted me to horn on the storied work of one James “Jimmy” Impossible, who wrote extensively on all things Spider-Verse. I mean, he wrote seven long posts chronicling every inch of Spider-Verse. 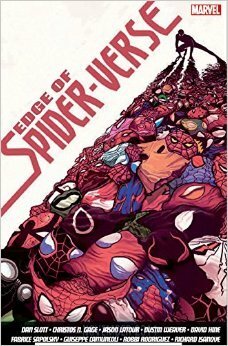 That was before he went insane trying to do the same with Convergence and the entirety of Secret Wars. See the efforts of his madness with parts 1, 2, 3, 4, 5, 6, and 7. Heck, Jimmy covered all the issues in this trade in the third part of his work there. But I’m writing a review, while Jimmy was giving a plot summary/commentary. That’s my excuse and I am sticking to it. The volume in question was a thin one, and I wasn’t expecting much. A brief flip-through suggested I’d get a kick out of part four, where the Spider-Man in question was a monster. Like, a literal one but also a rather twisted kid to begin with. As it turned out, I rather enjoyed the volume. The individual stories got weaker with each one, meaning the best was the first and the weakest was the last, and even the last one wasn’t terrible. First up with Spider-Man Noir, a hard-nosed 1930s adventurer. Good art, good period work, and I dug it. I may have to track down the original Spider-Man Noir story. Then there was Spider-Gwen. Her story was written by Gerard Way, former frontman for My Chemical Romance, and Gwen plays the drums for a rock band, justifying the volume’s inclusion in the Comic Bento musically-themed box. Considering my stated distaste for Gwen Stacy in general, I was pleasantly surprised. The story was light and breezy as Gwen did the Spider-(Wo)Man thing and was just a fun story. The third was like someone took the basic synopsis of Spider-Man and just applied it to a new character and universe. Dr. Aaron Aikman was a more technological Spider-Man, and his adventure ended in a way to suggest he won’t be coming back. That’s too bad. The highlight may have been the fake Marvel trading cards tossed in to give backstories to bad guys floating around complete with fake first appearances and trivia that didn’t add to anything other than the general feel of the story. The monster Spider-Man was next. Playing out like a horror story, this was a Spider-Man that, quite frankly, deserved what he got. The mood was good, but the story itself didn’t work quite as well as I had hoped. Finally, there was SP//dr, some sort of hybrid Spider-Man where a spider bonded with a girl, daughter of the original SP//dr, and fought crime in a giant robot suit. Nice images, but the story felt more like a general introduction and there wasn’t enough to make the thing feel more complete than that. All things being equal, it was fun. I haven’t read the rest of Spider-Verse and don’t intend to any time soon, so let’s say this story got a seven and a half Daredevil cameos out of ten. NEXT MONTH: Comic Bento’s theme for next month is “Powerless,” where the ordinary have to take on the powerful. I am thinking there should be a Batman-family trade in there, or maybe a Punisher. We’ll just have to wait and see.